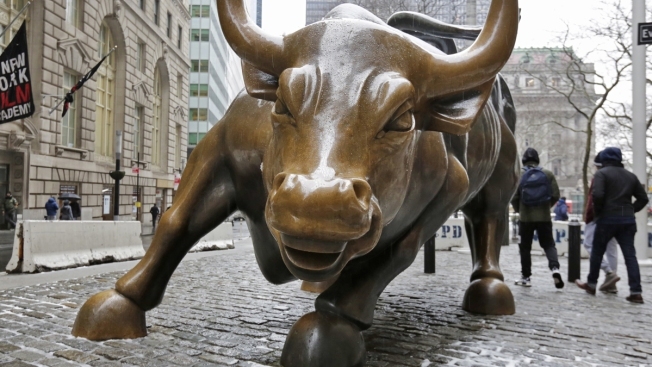 A file photo of the Charging Bull sculpture by Arturo Di Modica, in New York's Financial District. Though the recent stock market volatility is likely giving investors motion sickness, financial advisors are reminding them that it might be best for them to hang on through the decline. The Dow Jones Industrial Average fell by 800 points on Wednesday. Stocks continued their descent on Thursday morning. As if that weren't enough to shake up investors, mutual firm giant Vanguard experienced outages on Wednesday, resulting in some clients having problems accessing their accounts online or on the phone. "We identified and fixed the problem, which was related to maintenance to one of our network connections," said Carolyn Wegemann, a spokeswoman for Vanguard. Stocks are getting slammed. Five experts weigh in on what to do now from CNBC. "I'd note the issues were unrelated to yesterday's U.S. equity market downturn, or associated call or online trading volumes," she said. If you were unable to get into your account to partake in the sell-off, it just might be a good thing, financial advisors said. "We're not recommending any changes for people who are saving and accumulating," said Blair duQuesnay, a certified financial planner and investment advisor at Ritholtz Wealth Management. "Next time, you can buy into the market at a lower price than last month, but a 3 percent decline off of all-time highs isn't a time to become concerned," she said. Stocks have hit record highs during 2018 in the march toward this latest decline. The overall trend has been upward since stocks hit their nadir on March 9, 2009. That said, it's easy for investors to lose sight of their longer-term goals and obsess over a stretch of down days. "Literally 10 years ago today, there was an intraday swing of 12 percent," said Jeffrey Levine, CEO and director of financial planning at BluePrint Wealth Alliance. "The fact is that nobody thinks about that now: It's noise and it happened 10 years ago." A bad day isn't necessarily a sign of an impending downturn, said Andrew Adams, a market strategist with Raymond James. "This is perfectly normal, and we've gotten complacent," he said. "We're of the opinion that we're in the middle stages of a bull market. "We see a few more years of good stock returns." Rather than reflexively selling out of your stock holdings, take a step back and consider the following. Revisit your goals: As long as you don't bail from stocks, you aren't locking in your losses. Think about your savings goals and the amount of time you have to reach them. "If you're investing for a one-year time horizon, then maybe the market isn't right for you," said Levine. "But even today, people need to be invested long-term." Resist the urge to act impulsively: It's okay to be a little concerned about the market sell-off, just make sure you don't act on your fears. "We jump reflexively from the emotional to action," said Daniel Crosby, president of Nocturne Capital. "Most people think we have to act in a way that is wholly consistent with our feelings." Buying on a discount: If you're investing for the years ahead, a downturn might be a good time to snap up stocks while they're cheaper. "This is the best buying opportunity we've been given in quite a few months," said Adams.